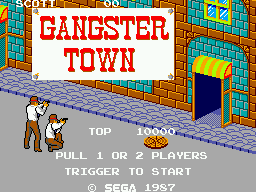 Gangster Town is a light gun shooting game developed and published by Sega for the Sega Master System in 1987. The game makes use of the Light Phaser peripheral. Gangster Town is set in 1920s America, with the player assuming the role of an FBI agent tasked with eliminating criminals. Main article: Gangster Town/Magazine articles.